What’s left of photographic archives depicting important events in Chinese history? Many voices would agree: not much. China experienced a dramatic loss of artefacts because of over a hundred years of political and social turmoil. The successive wars in the late nineteenth and early twentieth centuries – cumulated with the decade of the Great Proletarian Cultural Revolution (1966-76) – forced people to destroy family records, and led to the dispersion of many images abroad when they were the property of expatriates. 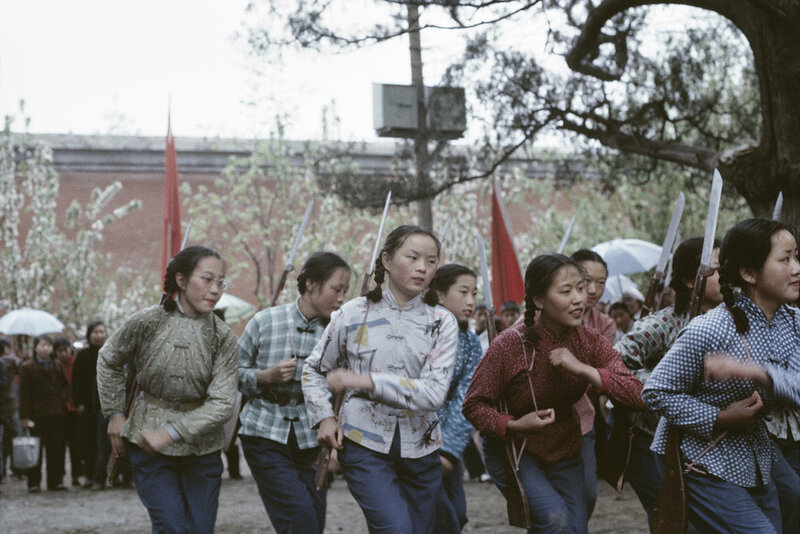 The photographs taken in the late 1960s by the French Solange Brand (born in 1946 in Paris) provide rare informal views of the Cultural Revolution, which was a period of political upheaval launched by Mao Zedong to encourage a return to revolutionary attitudes. ­One of the reasons why Brand’s snapshots are particularly significant is because eye-witness accounts of this period are rare. Most of the materials have disappeared and those left to us remain mostly black and white photographs produced by Western photojournalists or color propaganda pictures made by Chinese official photographers. Brand took these images when she was only nineteen, working as a secretary at the French Embassy, and discovering China after being recruited in high school. 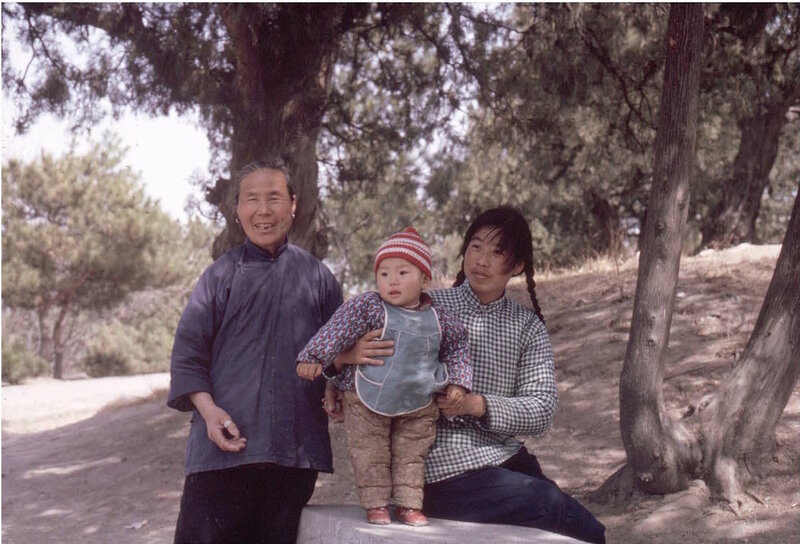 During her stay in Beijing between 1965 and 1968, she had the opportunity to visit Datong, Nanjing, Suzhou, Hangzhou, and Shanghai. Back to France, Brand pursued her interest in images by working as an art director at the French monthly newspaper Le Monde Diplomatique between 1980 and 2004. Today she has preserved several hundreds of photographs (diafilms) – including four hundred that she has digitized – sound recordings, personal notes and letters. In addition to her personal archive, Brand has been also collecting films and photographs that belonged to close friends. In that sense, accumulating and transmitting as much as possible a variety of memories of a bygone China has been central to her endeavours. Her unique coloured photographs have already gained international recognition. Her photographs have been shown around the world, including Pingyao International Photography Festival (2002), Beijing Danshanzi International Art Festival (2006), Etnografiska Museum in Stockholm (2008), the 6th Promenades Photographiques in Vendôme (2010), Robert Klein Gallery@Ars Libri in Boston and the French Cultural Center in Hamburg (2016) amongst other venues. Her book Pékin 1966: Petites Histoires De La Révolution Culturelle (published in 2005) received a special mention from the jury of the 2005 Nadar Prize. It has been translated in Japan and a Chinese edition has been published in 2015. The book was also described in Martin Parr’s authoritative The Chinese Photobook as one of the key photo-books that chronicle the historical episode of the Cultural Revolution. Through her exceptional personality, Brand invites us to rethink our vision of Chinese history through a variety of visual stories. Do you remember your initial experience at making photography? China was my initial experience at making photography; beforehand I had never practised it. My father gave me his old camera when I left. For a couple of months I experimented it, and as soon as I gathered enough savings, I purchased a Pentax in Hong Kong... then came the discovery of the magic of photography! This probably explains - together with my young age - why my photos look "candid". I was completely self-taught and learnt things outside the field. I never received any artistic training but certainly had a rather innate sense of composition. Once I had the Pentax camera in my hands, I experienced the technique, playing around with the shutter speed and so forth. I shot several black and white roll films, but decided to focus on Agfacolor films, which I could buy and develop in Hong Kong as colour films were not available in China. I took the majority of the photographs during the first years. Many dated back to 1966 because this year saw the launching of the revolutionary movement, when public parades mobilized hundred of thousands young Red Guards down the streets. In 1967, the situation turned chaotic, more violent and there were less if none public parade. I remember how I felt the need to capture the events I was witnessing - with no other idea that to keep track of them for myself. No intention, as well, of telling a story or proving anything. I was unaware that this mass movement would become a major episode in the history of China. What was your process of taking a photograph? In general, I simply seized what I was interested in, as fast and discreet as possible, when strolling the city streets or from a car when I had the opportunity. I shot along my mood or the moment. I didn’t ask people to pose, except a couple of exceptions like this photograph that portrayed three-generations women. It was taken at the Summer Palace and I “asked” them – using body gesture and smile because I didn’t speak Chinese – to pose in front of my camera. Can you tell me more about your experience of living in China during the Cultural Revolution? When I left Paris, I was leaving everything behind me, my family, high school, everything. To me, China was the earth's hidden face. I was alone and independent. It was my very first steps towards autonomy. This journey is intrinsically linked to my personal memories. In other words, it’s not only the visual memory of a country but also a chunk of my own life. The photographs mirror my own experience as a young girl, they also reflect my discovery of freedom. I always felt I was privileged to be in this place at this moment and was ready to absorb all what was surrounding me. Everything was a revelation. I never had any problem, Obviously, I didn’t represent any danger despite all the tensions of that time. I was young and innocent, only twenty so around their age. And I remember also how I felt frustrated not being able to communicate with the Chinese because of the language and the political situation. May 1, 1966. Revolutionary chants and dances. © Solange Brand. We can tell from your photographs that there was an incredible energy, which perhaps shaped or affected your attitude? At the beginning of the Cultural Revolution there was an incredible energy and popular enthusiasm. The point was to change the world and I was in total empathy with such ideal back then. I was 20 and it was before 1968… I cannot betray what I could have felt at that time. I was living History without being fully conscious of it. Because you can only understand it in retrospect. Yet I realized that something important was happening, especially with these masses of young people moving towards a specific goal that still evaded me. Everyday brought about a new momentum, thus it was impossible to realize its impact and consequences. One element lead to another. Such circumstances always makes me think about Stendhal’s character Fabrice Del Dongo [in Stendhal’s The Charterhouse of Parma chronicles], when he wandered onto the field of the Battle of Waterloo. Like Del Dongo, I experienced an historical event without understanding what it would mean in history! Of course I was aware of alarming reports and what I could heard at my work made me at times disquieted. But I have never personally seen any public humiliation. As a matter of fact, the French Embassy was located in Beijing suburbs, in Sanlitun. Whereas these type of events happened in the city core. Though, I have preserved letters that described my concerns about the situation [see Brand’s 1966 letter in her publication below]. I always emphasize - and think important to stress this point - that my photos are not a reportage on the Cultural Revolution, I didn't witness its dark sides and horrors. This reality only became tangible later, once I returned to France and faced the reality of this devastating time. As all pictures, my photos depict fragments of reality and only take meaning through their captions or when replaced in their context. Have you seen many Chinese manipulating cameras when you lived there ? 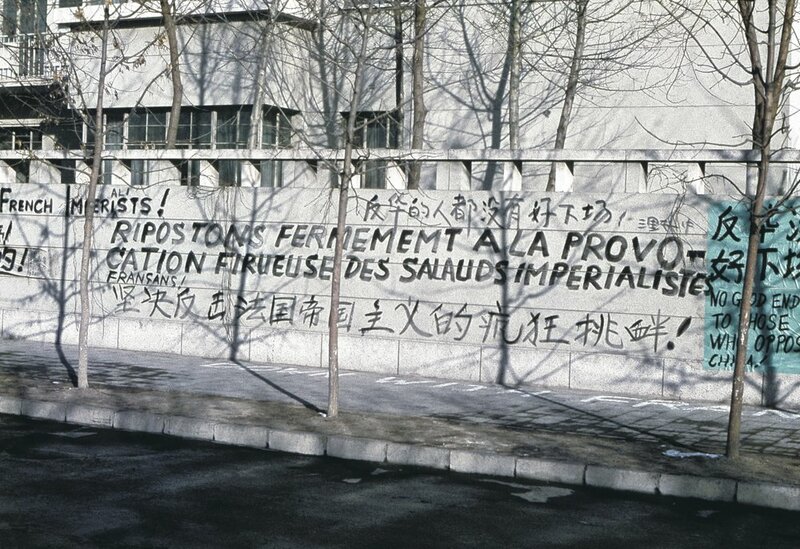 Around that time, Chinese students had been expelled from France because of their demonstration in front of the "revisionnist" soviet Embassy in Paris. This event prompted public outrage, and caused few days of street protests in front of the French Embassy in Beijing, as it happened against other embassies. Even children schools were brought to protest nearby their elders. I was shooting from inside the Embassy, behind the closed gate. Although they were shouting, brandishing fists in the air and spiting when we left the building, everything seemed under control to me. Hence I was not so frightened. Did you show these images to Chinese people? When I came back to France, I naturally planned a few private screenings for my family and friends and then stored the dias in boxes. I was all concentrated on my journalist work, first at Le Monde and then as an art director at Le Monde Diplomatique from 1980 to 2004. In 1992, I met a Chinese artist at the home of mutual friends and wanted to show him the Beijing of his youth. While we were projecting the photos he vividly reacted, standing immediately from his chair so as to point and comment details of the pictures. He was extremely moved and excited. He eventually became a close friend; his name is Ye Xin, he lives in Paris and is interviewed in my book [see reference below]. His reaction made me conscious of the value of my images, especially for the Chinese people. Since then, I had several exhibition opportunities that allowed me to show pictures to Chinese audiences. Each time it has triggered strong emotion and all kind of reactions. I remember for example that during the exhibition held at the Beaugeste Gallery in Shanghai , one man came alone, saw the images, broke down and sobbed. He was emotionally overwhelmed to rediscover his own past. He wrote a memorable comment on the guest book, similarly to others, hence from one exhibition to another I try to showcase these poignant comments. I hope I will have the chance also to display the photographs showing the reaction of people gazing at these pictures. Is there a specific series of images that particularly appeals to you? Not specifically. I consider them as a whole, as a general feeling. There are different reasons why this or that photograph makes sense and why I like them, because they might be associated to a specific moment, an impression. There are for instance these views taken from the Beijing Hotel. I used to stay there few months after I arrived, before moving to my own flat in Sanlitun that I shared with a friend. I went back to the hotel on 1st October 1966 to capture aerial views of the huge public parade. Beijing at that time was a flat and low city. Very little of the old buildings we see in these pictures has survived today, although some of them have been rebuilt. I remember I was shooting from the fourth floor, using my 135mm, without any tripod, bending over the window guardrail. I was only following my instinct. Nothing was fixed or planned; everything I shot was spontaneous. Another picture I like is the one I call “my Prince Charming”. It was a picture I took from a car en route to Beijing centre. You can even see the reflection of the window. I particularly love this man’s posture and dignity, the people around him, all staring at me. In june 1966, with a group of people from the Embassy, I had the chance to visit the city of Datong and the nearby Yungang buddhist grottoes. We visited this area during three days. All the people you see in the pictures gathered only to see us and probably never saw Westerners before in their lives. The temples were opened just for us. You can tell it had been closed for years, probably since 1949, just by noticing the thick layers of dust accumulating on the sculptures. I really like this series of photographs which has never been shown and which I dream to take back there. They appear far from the somewhat kitsch aesthetic we usually associated with religious representations. It was very dark inside the temples, so I located the artefacts with my lighter and shot details of the sculptures and murals simply with the flash, almost isolating them from their context. I discovered what I had shot only after they came back from Hong Kong. What image of China would you like to transmit to those who know little about it? The former tartar city also left an indelible impression on my mind. I still remember vividly my first impressions when I arrived in 1965. I discovered a grey and blue city. Then, little by little, the red proliferated. I loved wandering around the hutong [narrow streets or alleys then prominent especially in Beijing]. Those which remain today are like a lost world, they provide a lifestyle that belongs to the past, and I still love to lose my way in these sinuous streets. There is a ready-to-travel exhibition composed of forty or so photographs centered mostly on the Cultural Revolution, which I hope will continue to be exhibited in different venues. There are some ongoing projects in the United States and China. The most important for me now is to give back the memory of these vanished times, especially to the Chinese people.